Popular Sky Sports presenter Jeff Stelling will take a pit stop at Titanic Brewery as he completes the Staffordshire and Cheshire leg of a marathon effort to raise funds for Prostate Cancer UK. The presenter will slake his thirst at Titanic Brewery, Callender Place, Burslem, as he walks between Stoke City’s bet365 Stadium, Port Vale (Vale Park) and the Crewe Alexandra Stadium on Day 5 of a 15-day marathon. Jeff Stelling is expected at Titanic Brewery between 9.30 and 10am on Tuesday, 6 June. “It is fantastic that Jeff has agreed to drop in for a beer and recent research by the Spanish RFU indicates that beer is the best isotonic drink in the world so will be perfect for this marathon effort,” claimed brewery Director, Dave Bott. His visit follows a big fund raising drive by brewers, including Titanic. Titanic, which owns eight pubs in Staffordshire, Cheshire and Derbyshire pushed the boat out to support Pub Aid’s World’s Biggest Quiz initiative. 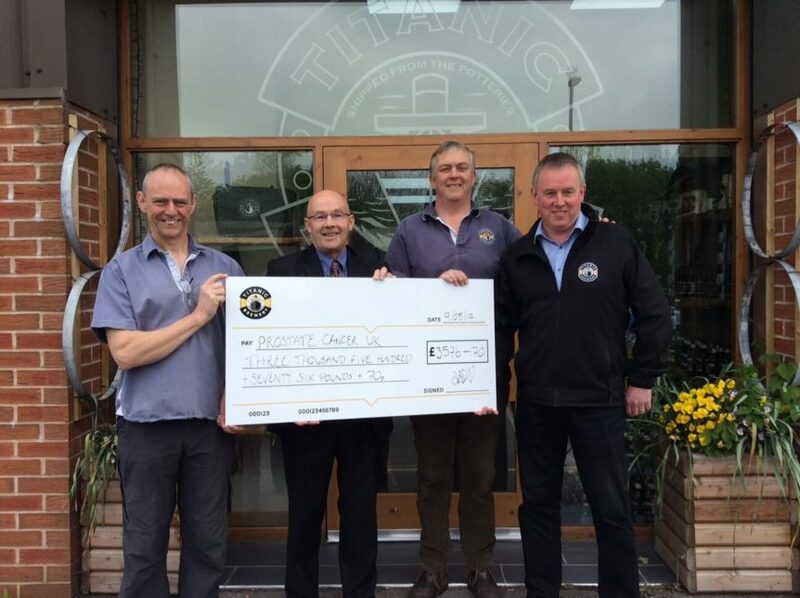 Brewery owners Keith and Dave Bott presented a cheque for £3,576.70 to Prostate Cancer UK following the event. “It was fantastic to be able to help Pub Aid raise funds for such a worthwhile research charity and all our managed pubs got fully involved,” said Dave. “Our pubs, in common with many across the UK, are keen centres of charity fundraising and we encourage them to support a variety of good causes. Titanic owns pubs in Burslem, Stoke, Newcastle-under-Lyme, Stone, Stafford, Congleton and Buxton. The award winning Burslem-based brewery supplies pubs, stores and restaurants across the UK, producing more than 3 million pints of beer a year. To find out more about Titanic Brewery please go online to www.titanicbrewery.co.uk.